Like Sequoyah Guess (b. 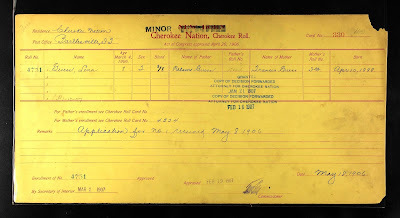 1890), Albert Guess was only a little boy when his father died and he was dependent on others to make sure he and his siblings were enrolled by the Dawes Commission. Sadly, Albert did not have adult Cherokees looking out for his best interest (or the interest of his sisters) so things didn't go as well for him as they did for Sequoyah Guess. After Nelson Guess, Albert's father, died in 1896, his white wife, Frances, remarried. 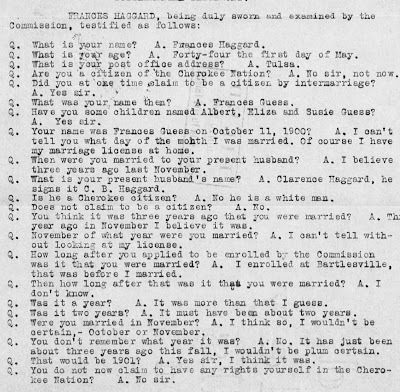 Available documentation from 1900 to 1913 indicates Frances and her new husband, a white man named Clarence Haggard, were more interested in what they could get from the Cherokee Nation and Nelson's Cherokee children than they were in taking care of those children and looking out for their best interests. 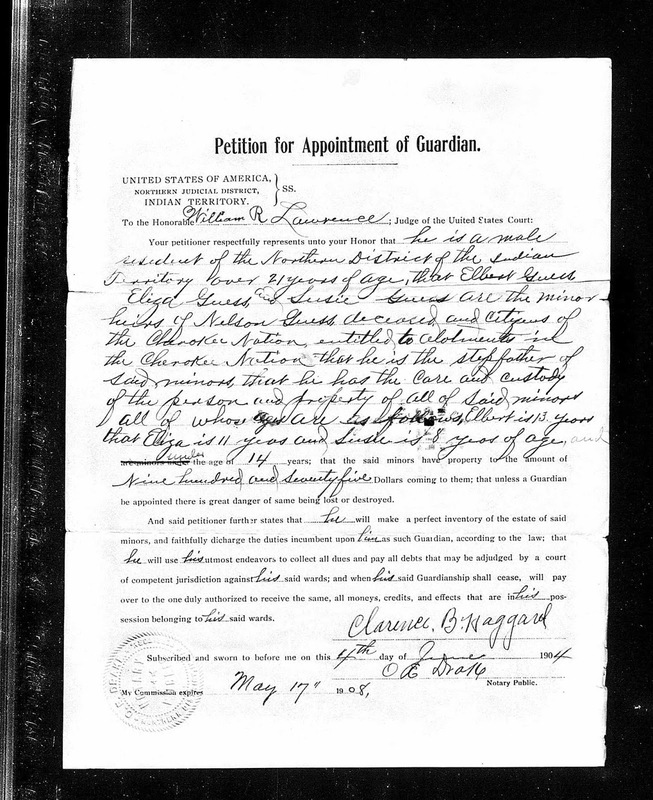 June 1900, the family was found on the U.S. Census. Clarence was listed as head of household with Frances as his wife; Dorcas Damon (child of Frances before her marriage to Nelson Guess) as his step daughter; Albert, Eliza, and Susie Guess as his step children; and Lena Haggard as his daughter. Lena was listed as born April 1899 and one year old. 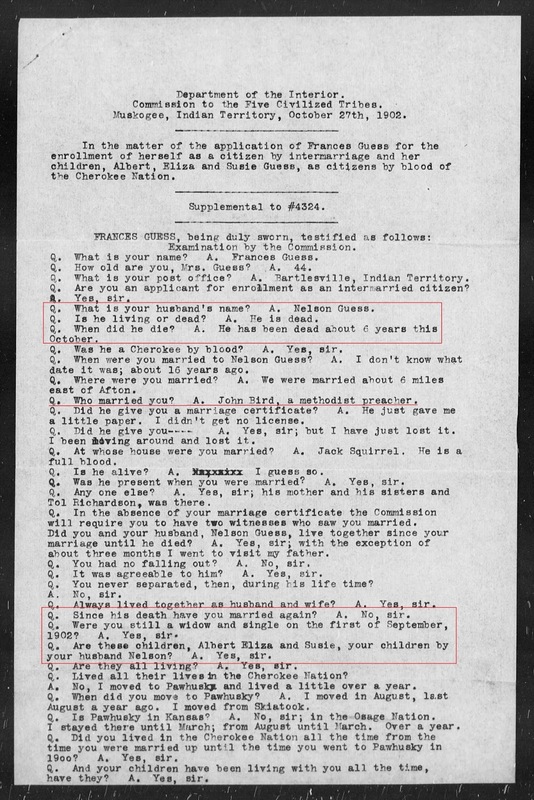 Later that year, in October 1900, Frances applied to the Dawes Commission for herself as an intermarried white and for Nelson's three children, Albert, Eliza, and Susie, as Cherokees by blood. She said Nelson Guess died three years prior (1897) and that she had not remarried since his death. 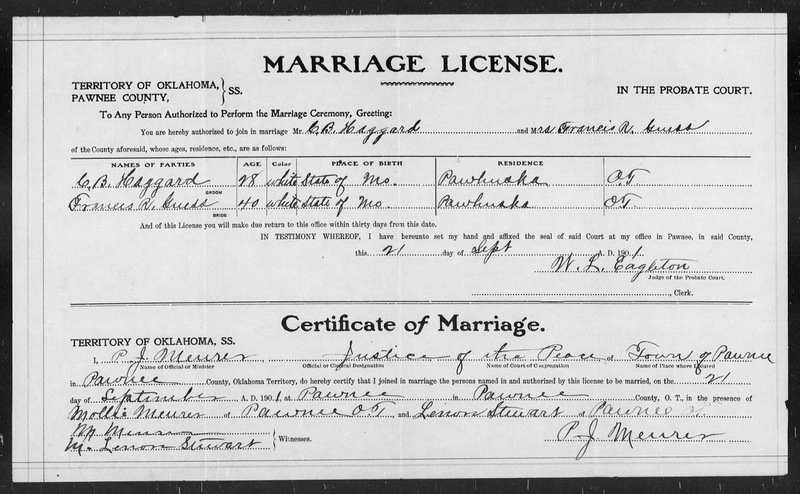 Technically, she was honest because she and Clarence didn't marry legally until September 1901. 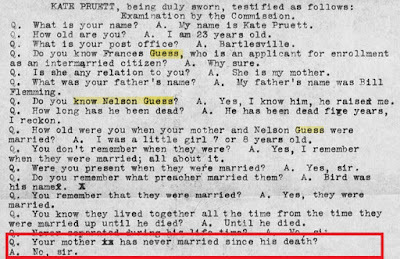 To make that clear, Frances Guess, widow of Nelson Guess, legally remarried in 1901 though she'd already been living with the man prior to the marriage based on information from the 1900 U.S. Census. In September 1902, WC Rogers, a store owner, wrote a letter to the Dawes Commission reporting Frances as a fraud, saying she had a new man, Clarence "Haggar", and had two children by him. He said she only had three children who were Cherokees, Albert, Eliza, and Susie. 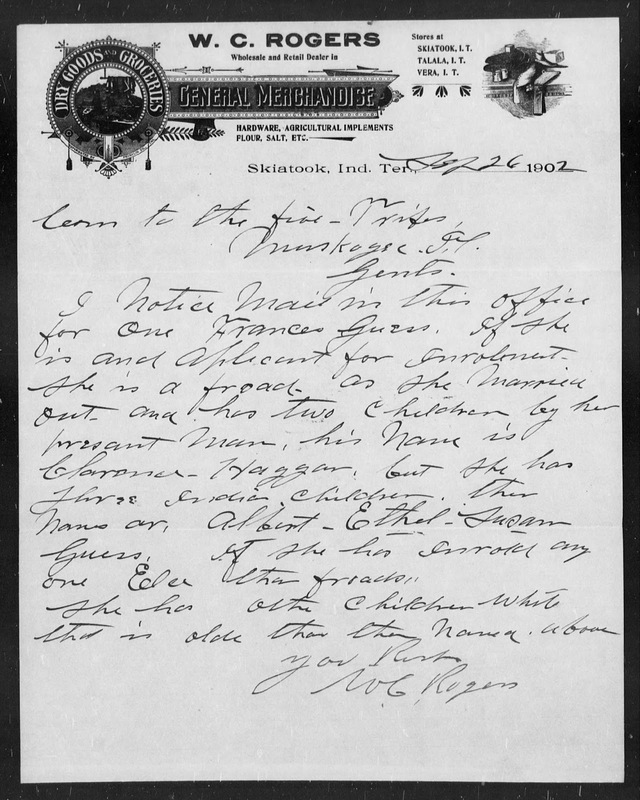 October 1902, Frances gave additional testimony to the Dawes Commission. She said Nelson had been dead about 6 years (1896) and that she was still a widow (unmarried) on September 1, 1902. 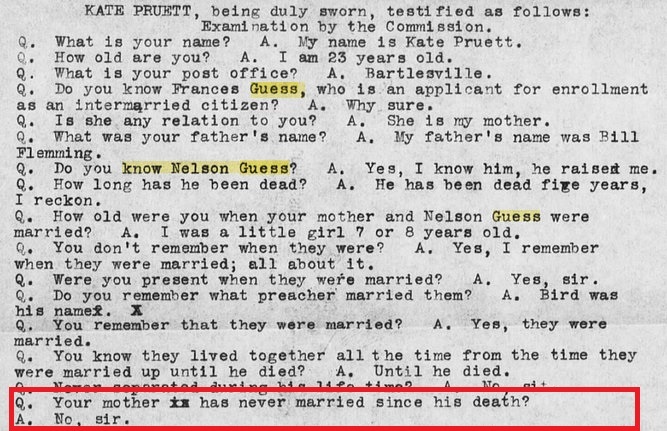 That same day, Mary "Katie" Flemming Pruett, a daughter Frances had from a marriage previous to her marriage to Nelson Guess, gave testimony that her mother had not remarried. Clearly, Frances and Katie lied. 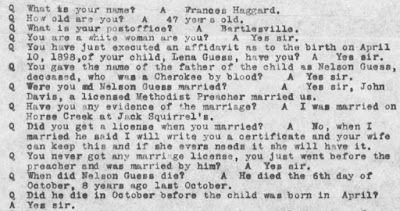 In March 1903, Frances was again questioned by the Dawes Commission and said she did not know Clarence "Hagar" and that she was not married. She also said Susie was her youngest child and that she'd had no children since Nelson's death. Frances lied again. May 5, 1904, JC Starr testified before the Dawes Commission and reported that Frances tried to bribe him, first with $100, then $200, to not report that she was married. She told him that she gave false testimony to the Dawes Commission and that if asked again, she'd repeat what she said even though she knew it was not true. 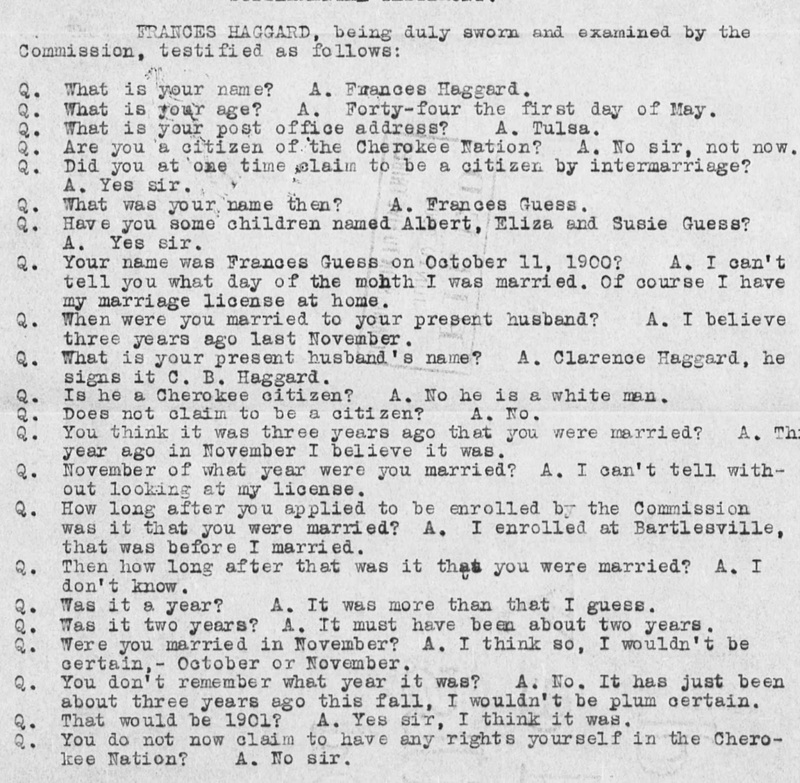 Finally June 1, 1904, Frances testified before the Dawes Commission as Frances Haggard. She admitted she had remarried and that she could no longer claim rights as an Intermarried White. Three days later, on June 4, 1904, Clarence Haggard sought guardianship of Nelson's three children. He said each was entitled to $975 from the Cherokee Nation (with inflation, this calculates to approximately $25,000 each as of 2014) and needed someone to oversee their estates for them. Clarence was granted guardianship. Later that year, on December 26, 1906, Frances filed an Eastern Cherokee application for Albert, Eliza, and Susie. She did not mention Lena. Four times she said Nelson Guess died in 1896. 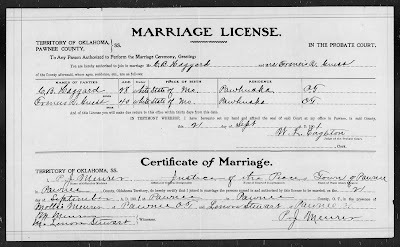 She said she married Clarence Haggard in 1898. 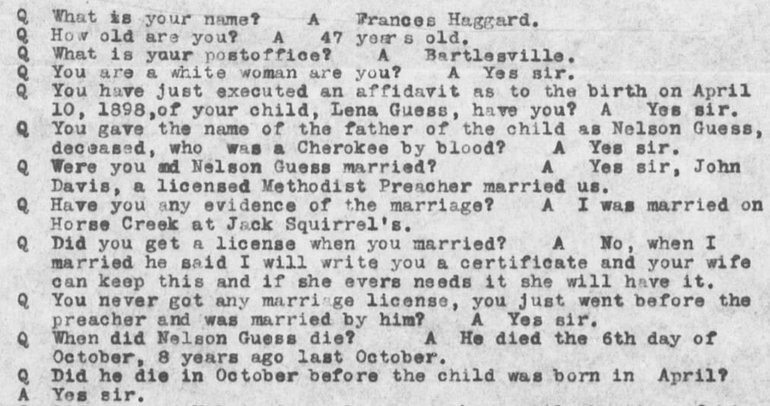 While it's clear, based on the documentation, that Lena was the biological child of Clarence Haggard, and it is clear that Frances lied about Lena's paternity, on February 19, 1907, Lena was approved for enrollment on Dawes as the child of Nelson Guess. The Cherokee Nation lawyers did not challenge the enrollment despite the conflicting testimonies and lies Frances told in her previous attempt to get herself enrolled. Unfortunately, that is not the end of the story. Stay tuned for the part two of The Children of Nelson Guess where more of this sad tale of lies and deceit will be continued.